The folks at mobile backend provider Parse, just launched a new feature allowing developers to implement, “Sign in with Twitter“, for both iOS and Android devices. This is now in addition to the already existing “Sign in with Facebook“. Check out the Parse iOS and Android guides for more information on this essential feature for all mobile applications. 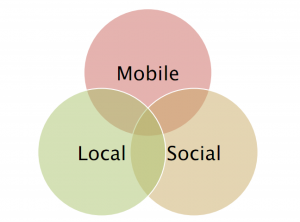 What is Social in Local, Mobile, Social? I am working to define a CityGrid Local, Mobile, Social stack, to help CityGrid developers more efficiently build web and mobile apps. This definition will contain APIs, tools, platforms and other data sets that can be used along with CityGrid Places, Offers, Reviews and Advertising. But where do we go next with social in our local mobile applications? We can find our friends, we can check-in and socially share what we are doing in our every day, local lives–but it seems like there is more that I’m missing. I have some rough ideas of what could be next for social, but I’d like to solicit thoughts from you developers regarding what is next, when it comes to making your local, mobile apps social. What are you doing in your apps? What do you see others doing? Ping me @citygridapiteam with your ideas. In February I’m spending more time building, what I’ve dubbed the CityGrid Local, Mobile, Social Stack, a list of APIs, platforms and tools that you can use in your local-mobile applications. Of course CityGrid Places, Offers, Reviews and Advertising are first in that stack, but I want to identify other APIs, tools and platforms that can also assist you in quickly building your mobile app. Real-time Location Tracking - Low battery impact, easy to setup mobile location tracking system, built for multiple platforms. Location-Based Messaging - Location-based messaging tools, allow developers to send messages upon arriving, dwelling or leaving a place, as well as time or day or a user’s speed. Battery Safe Trigger Zones - Enables management of a device’s battery life while using location, to minimize battery drain. Trigger actions on enter, dwell or exit, speed and temperature coming soon. Battery Safe – our SDK automatically manages battery life. Hosted Spatial Storage - Create and store places, messages, and geofences. Geoloqi is a perfect addition to the CityGrid Local, Mobile, Social Stack. They offer some essential location tracking, location messaging and storage every mobile app can take advantage of, and they do it all in a way that considers your users battery life–which will make for a much better user experience. In Spring 2012 they are also working on rich location based analytics, so you can gain more insight into your mobile app users behavior. I’m adding Geoloqi to the CityGrid Local, Mobile, Social Stack and will be weaving more of their services into what we offer here in the CityGrid Developer Center as well as our hackathon tools.